In the previous node, you used the Circle Class without touching any of its code. In this node, we'll look at its actual code and make some changes. Below the Class declaration, the instance variables, which hold data about the Object and are available to all its code, are declared. In this case, they store information about the position and appearance of the Circle. The constructor appears under the instance variables and is used to set up their initial values. A constructor is just a method with the same name as the Class that runs when an instance of the Class is created. Currently, Circle's constructor just assigns hard-wired values (like a diameter of 30) to the variables, instead of allowing the variables to be set. Also, the Circle is not visible when created, but requires another call to the method makeVisible() to show up. It would be useful if you could set different initial values for the Circle. Create a new constructor that takes in parameters to set the values of diameter, xPosition, yPosition and color. 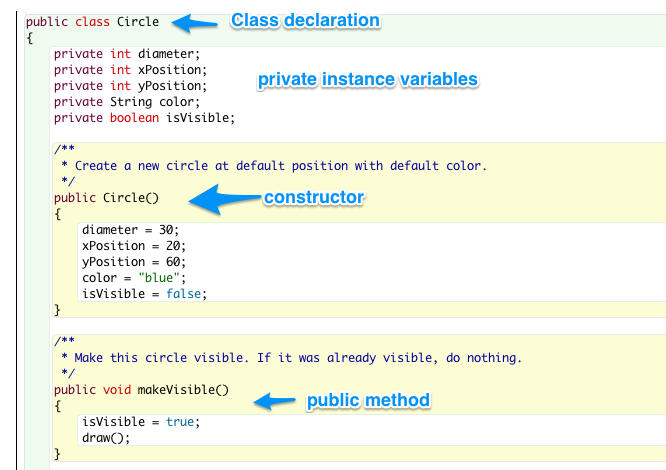 To make the Circle visible on creation, call makeVisible() at the end of the constructor. The acclerateMissileToSpeed method is missing a pair of curly braces but that is an compile error in two lines of code i guess. @Peter, thanks, its been fixed. @calo, can you find a private instance variable that is being accessed directly from outside the class? I don't get this, and I have a question: Public Missile(int rocketFuel) is our constructor which takes in a parameter, and it has two variables speed and fuel. we created a new variable with the type of Missile so does missile has the same properties of the constructor? but as a variable? can we use this technique to store in arrays? create our own type and store various information in one slot of an array? I am not sure how to access the private instance variable. Does it matter if I use this. or super()? You cannot access private instance variables from outside the object, that's why you use accessor methods. I have the following but i dont see a circle, it gives no errors??? about the last challenge. the variable speed is private, so millile cant reach that i guess. So i think thats the problem..
i cant figure out the solution doh, so what is the solution? Could you please tell me why this happened? I can't see the exact code you used. According to your message, the problem happened at line 124 of the Canvas code file, when it was trying to setForegroundColor. Do you see anything that could have gone wrong there? values. This causes an error when the code later checks the value of colorString but it's null. You'll need to set the values of the variables in your constructor. (See https://www.learneroo.com/modules/18/nodes/133). Good luck!